A curious examination in physics... or evidence of spiritual intelligence? A garden that can assist in repairing psychological and mental trauma, brain injury, epilepsy and depression. Many people seek refuge in their gardens for relaxation, healing and repair, and have done so for many centuries all over the world. Indeed, it is well known that many plants have therapeutic properties for different types of illnesses. Yet rarely are gardens designed specifically and scientifically for the treatment of illness and trauma. 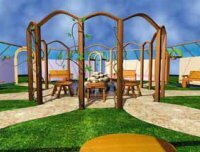 The Refuge Garden has been designed to facilitate the natural recovery and healing process for head injury patients, and also as a healing ecology for other types of illness. It is a quiet haven for rest, repair and renewal. The concept of the design is based on a very thorough research into the natural workings and functions of the brain, which cannot be considered only from its physical characteristics. It is now becoming well known that the brain works by very small, though sometimes very potent, electro-magnetic micro-signals, which pass through various 'neurone circuitries' and 'wiring arrangements', which we assemble and put together ourselves, by our experience and the decisions we have made. These are the thought patterns which govern human behaviour. These circuitries, across the millions upon millions of inter-connected nerve cells, then become the filters and receptors by which we can recognise or give credence to certain ideas, imagery and impressions, for instance. When the brain gets damaged in any way - whether that is physical injury or psychosomatic, psychological, mental trauma or depression, because these are all injuries to the brain - the brain can no longer handle the same levels of stimulant which it otherwise would be able to in its normal state. It is also known that the brain possesses the capability to regulate its own functions as well as controlling and co-ordinating the countless processes at work within itself. If a brain functions normally at say 80% and an injury occurs or a depression hits, or there's mental trouble or divorce, then it can shut down and work at only half its former capacity, at say 40%, and so it has to neutralise the other 40% which it cannot handle. It just simply doesn't have the same capacity and endurance as it did before the injury, so it has to reduce its coverage of operation. The brain works by passing micro-signals from one part to another through its own circuitry and so the brain neutralises and equates part of itself, so that the signals get diffused and can no longer pass around its circuitry. But the problem then compounds, in cases of shock and trauma, because any further electro-magnetic activity which the brain receives from all kinds of internal and external stimulation cannot be stored or departmentalised, and blockages occur. Any signal which cannot be stored has no use and it therefore starts to toxify, just like food which cannot be digested. One of the major problems for patients recovering from brain operations, traumas or depressions is this toxic factor. Now the brain will try and expel this toxic factor literally from head to toe along the meridians of the energy system of the human polarity which work from north to south. Thus, these energy toxins can be expelled and cleared out through the feet, which is the principal outlet in the body for the discharge of electromagnetic energy. The Refuge Garden will provide a place of rest and relaxation where these toxins are removed, and the more these toxins can be cleared out, then the quicker the brain will be able to repair, rebuild and heal itself. In particular, it is very alarming to know that many head injury patients also begin to suffer from epileptic fits as a direct consequence of head injury, which might well be caused by not having the opportunity to detoxify the poisons which build up due to the incapacity to handle too much stimulation, which then accumulates to such a state that the body has to, quite violently in some cases, reject it out of their systems as a fit or seizure. It is hardly surprising therefore that many epileptic patients recognise that too much stimulation such as that caused by strong flashing lights can trigger their seizures, and some patients even recall a 'flooding sensation' prior to the onset of their seizure. The other significant thing that happens in people when their brain is working at a reduced capacity of say 40%, is that a person regresses along their years of life back into a state of childhood which was the time when the brain was last working at that capacity as it was developing, with the expansion and growth of its circuitry being accumulated and put together from experience. For example, one of the reasons why children are fascinated and inspired by colour, is that colour plays a very significant and natural part in how the brain becomes coded and printed. The brain therefore can begin to repair and rebuild itself through a re-engagement with the appropriate use of colour. The brain itself will be directly aware of the colours it needs to re-engage with and will also know which of its own colour circuitries have become damaged. Colour therefore is all-important in the recovery process, and the whole of the Refuge Garden is specifically coloured so that the patients can sit within the specifically selected colours of the surrounding walls as an important part of the rebuilding process. For instance, there are individual and groupings of colours which are known to have therapeutic and calming influences on the brain. It is also very important within the recovery process that the brain is caused to start to stimulate the nervous system, rather than the other way around with the nervous system stimulating the brain, so the whole ecology within the garden is also designed to be sedatory to the nervous system to further facilitate the recovery process. The brain, therefore, has an extraordinary and awesome capability to heal itself over a period of time although the process can be very slow if it happens at all, except in very exceptional cases, because the ecology which most patients find themselves in does not facilitate the natural recovery process. In fact, it can often act against it. The Refuge Garden, therefore, is uniquely designed to provide a natural ecology of refuge in which the brain can begin to recover and re-establish. 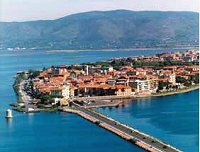 And the first Refuge Garden, in Orbetello, Italy, has already received council funding and planning permission. So the vision becomes reality! Trevor Muir, Chartered Architect BA (Hons) Dip Arch RIBA.